Branding and marketing play an increasingly important role for retailers and wholesalers in our competitive global marketplace. 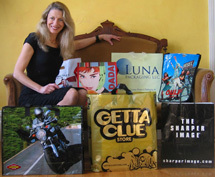 Luna Packaging LLC was founded by Julie Hamilton, President, and her husband, Dean Millican, CFO. Julie brings 20 years of experience in the packaging industry and a keen desire to provide her customers with exceptional quality custom printed packaging at very competitive prices. Through exceptional mills both domestically and abroad, Julie can help you create an effective packaging program that will not only be a simple convenience for your customers, but also a brilliant walking billboard for your retail store or brand. And we are pleased to offer many "GREEN" PACKAGING options for environmentally responsible packaging. Whether your look is fun and funky, natural and earthy, or elegant and upscale; Luna Packaging has custom printed packaging to fit your needs.